Senator Scott Brown and his wife, Gail Huff, toured businesses in Roslindale Village today. The Massachusetts US Senate race, already framed in terms of electing the best guardian for the middle class, will be fought by two candidates in the nation’s top income group. Tax returns released today show that Republican Scott Brown’s family income more than doubled to nearly $840,000 after he was elected in 2010, while his likely Democratic challenger, Elizabeth Warren, has had nearly $1 million in joint earnings two of the past four years. During the most recent filing year, she was in the top 1 percent of earners while he was in the top 2 percent. Brown joined Warren in the uppermost echelon in 2010. 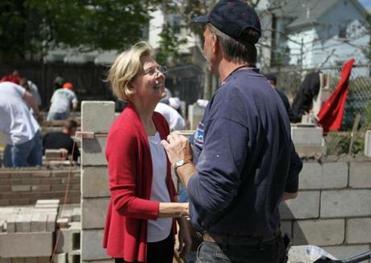 Elizabeth Warren (left) met with Mark Stemple while taking a tour of the Bricklayers & Allied Craftsmen Apprentice Training Center in Dorchester today. Elizabeth Warren made available four years of federal and state income tax returns, covering the years 2008 through 2011. The returns, released in response to a request from the Globe, showed that Brown’s income skyrocketed after he became a national figure by winning his Senate special election campaign - from more than $294,000 in 2009 to almost $840,000 in 2010 - thanks largely to a book advance for his life story. For the most recent tax year, 2011, Brown and his wife reported total income of $510,856. They paid $123,642 in taxes, about a quarter of the total, and contributed $16,487 to charity, or 3.2 percent of their total income. It was their highest charitable payment during the past six years, more than double what the couple donated in 2007. Brown’s 2011 return also listed $1,401 in “TV makeup and grooming” costs incurred promoting his book. Warren and her husband, Bruce Mann, had income peaking at nearly $981,000 in 2009 and almost $955,000 in 2010. In 2011, Warren and Mann, a fellow Harvard Law professor, reported total income of $616,181, state and federal tax payments of $191,052, and charitable contributions of $17,209, or 2.8 percent of their total income. Warren and Mann prepared their own returns; Brown and Huff had them handled professionally. Since Brown was elected to the US Senate in January 2010, the Republican has been paid the standard rank-and-file congressional salary, $174,000 per year. But he also received a $700,000 advance for his memoir, “Against All Odds,” sharply increasing his income. His returns show $300,000 in additional book income last year. His staff would not describe it as royalties, suggesting it was a contract payment for delivering the manuscript. Warren’s most recent federal financial disclosure form showed she was paid an average of $350,000 annually by Harvard in 2009 and 2010. As of the 2010 Census, the median household income in Massachusetts was $64,509. Candidates for prominent public offices frequently release their tax returns in the interest of transparency, and to reassure voters that their personal financial practices parallel their public rhetoric. This morning, in response to a request from the Globe, Brown emailed reporters a recap of his federal and state income tax data for the past six years. He also agreed to make copies available for inspection at his South Boston campaign headquarters. The summary showed a combined income of $357,000 in 2006; $276,000 in 2007; $288,000 in 2008; $294,000 in 2009; $840,000 in 2010; and $511,000 in 2011. It also showed tax payments of $75,000; $60,000; $63,000; $65,000; $237,000; and $124,000 in those respective years. His effective tax rate ranged from 21.01 percent in 2006 to 28.28 percent in 2010. The Browns claimed their younger daughter, Ariana, as a dependent in the most recent tax year. She has been a student at Syracuse University. The couple did not claim their elder daughter, Ayla, a Boston College graduate and former “American Idol” performer who now is a professional singer and has worked as a correspondent for CBS News. In both 2010 and 2011, the Browns did not report any income from real estate investments, even though the couple is listed in city of Boston assessing records as the owner of three condominium units in the 1800 block of Commonwealth Avenue. One of the units is co-owned by the Browns and their elder daughter, Ayla. On two rental properties in 2011, the couple listed no taxable income because their expenses - including mortgage and depreciation - were greater than their income. For the same tax years, Brown did not use the tax deduction for business expenses provided to members of the military reserve, the returns show. Brown has been a member of the Army National Guard for more than 30 years. Warren’s summary showed a combined income of $831,021 in 2008; $980,670 in 2009; $954,721 in 2010; and $616,181 in 2011. It also showed tax payments of $278,801; $333,555; $317,103; and $191,052 in those respective years. Her effective federal tax rate ranged from 25.84 percent in 2011 to 28.78 percent on 2009. Taxes and income have become a special flashpoint in the developing race between Brown and Warren, the likely Democratic nominee. Brown is trying to protect his image as a truck-driving, barn coat-wearing everyman. Warren is promoting herself as a Plains-bred, middle-class champion, deflecting Republican critiques that her personal wealth makes her unsuited to speak for the average voter. Warren has also called for higher taxes on the wealthy and said middle class workers are not getting the same favorable treatment as the affluent. Brown, meanwhile, has tried to draw attention to Warren’s personal wealth and questioned why she has not voluntarily paid a higher state income tax rate, as Massachusetts allows, if she believes the wealthy should pay more. His campaign has also drawn attention to an interest-free loan Warren received from Harvard Law worth between $15,001 and $50,000. It was disclosed on her federal financial disclosure forms. The Brown campaign has labeled it a “sweetheart deal” in light of the rising costs of college. But the details of the tax returns also carry risk for Brown, who has built his reputation as an everyman despite owning multiple personal and investment properties, and receiving the $700,000 book advance. Brown’s summary showed charitable contributions of $9,600 in 2006; $4,000 in 2007; $4,600 in 2008; $6,900 in 2009; $12,900 in 2010; and $16,500 in 2011. The percentage of donations to income was 2.69 percent; 1.43 percent; 1.60 percent; 2.35 percent; 1.53 percent; and 3.23 percent in those respective years. Warren’s summary showed charitable contributions of $26,534 in 2008; $24,442 in 2009; $27,816 in 2010; and $17,209 in 2011. The percentage of donations to income was 3.19 percent; 2.49 percent; 2.91 percent; and 2.79 percent in those respective years. The Globe had initially asked for this year’s returns, plus the five previous years, on April 17, when the tax-filing deadline triggered a battle between the candidates over tax policy and their personal finances. The Warren campaign was the first to respond to the Globe’s request last week, agreeing to release two years of returns, but only on the condition that Brown do the same. Brown’s campaign indicated soon afterward that the senator might release all six years. The issue escalated Tuesday morning, when Barnett sent a strongly worded e-mail to Warren’s campaign, declaring that Brown would make six years of tax returns “available for inspection,” whether or not Warren followed suit. He set the date for today and accused Warren of political gamesmanship. She ended up releasing four years of returns. Globe staffers Brian C. Mooney, Noah Bierman, and Stephanie Ebbert contributed to this report. Glen Johnson can be reached at johnson@globe.com. Follow him on Twitter @globeglen.